ARC’s Communications and Technology Transfer initiatives have been at the forefront of our efforts during the first half of 2017. As always, we are grateful to our Partners, Initiative Leaders, and Steering Committee members for their ongoing efforts to advance ARC’s mission of identifying and promoting leading-edge solutions to improve human safety, wildlife mobility and long-term landscape connectivity. The biennial International Conference on Ecology and Transportation took place in Salt Lake City, Utah (May 14-18). The ARC partnership was well represented, with 15 ARC partners and cooperating agencies attending and leading a variety of panels, presentations and posters on a range of topics including funding mechanisms, policy solutions, and design features for wildlife crossing infrastructure. ARC hosted an informal social gathering during which ARC Steering Committee members Jeremy Guth (ARC Co-founder and Trustee, Woodcock Foundation) and Darin Martens (Statewide Liaison and Landscape Architect, U.S. Forest Service/Wyoming Department of Transportation) presented awards of appreciation to Terry Brennan and Sandra Jacobson (both retired, U.S. Forest Service) for their life time contributions to advancing the field of road ecology and the mission of increased landscape connectivity. Sandra Jacobson also accepted the Jack Adams Memorial Award from the U.S. Forest Service for being a pioneer of transportation ecology throughout her career. 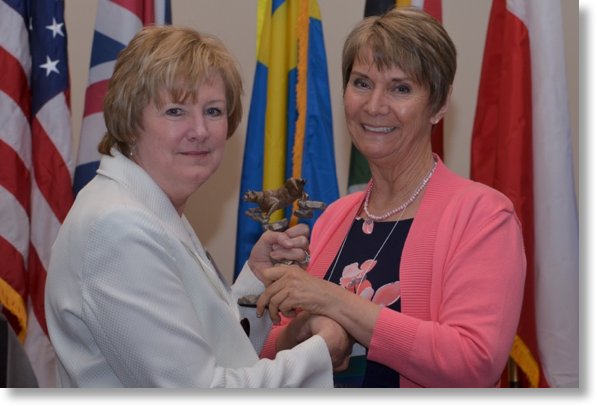 Sandra Jacobson receiving an award presented by Dr. Cynthia West (Executive Director, Office of Sustainability and Climate Change, U.S. Forest Service). Photo credit: Martin Palmer. ARC produced and distributed two special publications at ICOET. 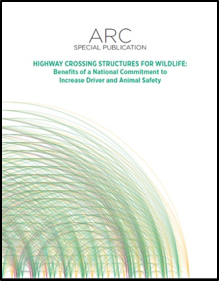 ARC Partner and Steering Committee member Sandra Jacobson, U.S. Forest Service (retired), led a podium presentation on the first publication, Highway Crossing Structures for Wildlife: Benefits of a National Commitment to Increase Driver and Animal Safety, which outlines the benefits of wildlife crossings as well as the barriers and opportunities to facilitate the widespread implementation of this category of infrastructure. 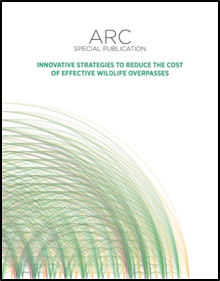 The second publication, Innovative Strategies to Reduce the Cost of Effective Wildlife Overpasses, describes planning, design, and implementation strategies that can be applied to reduce the costs of wildlife crossing infrastructure and was the subject of a 2015 ICOET presentation by ARC partner, Terry McGuire, P.E., Parks Canada. The two papers are high-level summaries of longer manuscripts slated for publication later this year. On April 26-27, the Wyoming Department of Transportation, Wyoming Game and Fish, and the Wyoming Migration Initiative co-hosted the Wyoming Wildlife and Roadways Summit in Pinedale, Wyoming, which attracted over 150 participants. ARC partners Rob Ament and Darin Martens were in attendance, and Rob gave a keynote presentation on Partnerships: Paving the Way to Implementation. On June 20-21, ARC partners Renee Callahan, Michelle Cowardin, Julia Kintsch and Darin Martens attended the Colorado Wildlife and Transportation Summit in Silverthorne, Colorado. During the Summit, Julia presented on the history of wildlife mitigation in Colorado, while Renee presented on mitigation funding, including federal transportation funding available under the FAST Act as well as other innovative funding approaches and sources. The event was co-hosted by Colorado Department of Transportation, Colorado Parks and Wildlife and U.S. Fish and Wildlife Service, with over 100 stakeholders in attendance, including representatives from the Colorado legislature. As part of the Colorado Wildlife and Transportation Summit, Michelle Cowardin and Julia Kintsch co-led a field trip to tour new wildlife crossings along Highway 9, including five underpasses and the state’s first two overpasses. ARC often receives requests for information from media organizations, community groups, academics, and students in classrooms spanning grades K-12 through graduate studies. As part of the Communications and Technology Transfer Initiatives, the ARC team works to provide useful and appropriate information and connect inquirers with members of the ARC network. This year, ARC has received several inquiries from students working on Lego Animal Allies projects, which encourage students to consider the ways in which humans and animals interact and propose innovative solutions to the issues they identify. The expertise of ARC ecologists and designers was also requested for features on VOX and the Wall Street Journal, and images from the ARC International Wildlife Crossing Infrastructure Design Competition are being featured in a landscape architecture primer entitled Sustainable Landscape Construction, forthcoming in early 2018 from Island Press. 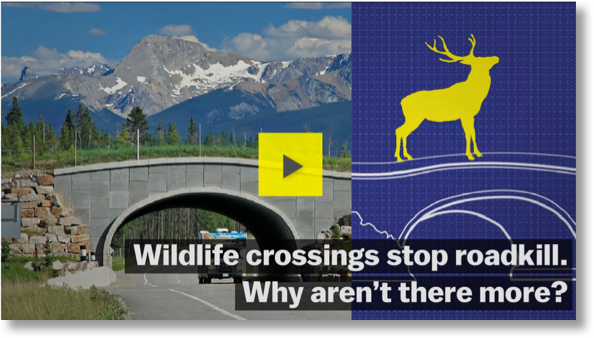 An informational video produced by Vox.com spotlighting the problem of wildlife-vehicle collisions and wildlife crossing infrastructure as a solution.